PB & J Girl loves science, especially hands on experiments. When we had the opportunity to review Exploring Creation with Human Anatomy and Physiology, I was a bit nervous. We always use the elementary science from Apologia, but I had planned to wait to cover anatomy and physiology with her until she was in 6th grade. (She’s currently in 3rd.) However, I had nothing to fear. She absolutely LOVED this science curriculum, and we plan to continue with it now that the review is done. The text is approximately 252 pages long and contains 14 lessons. There are natural breaks in the book for your child to narrate to you what they read. The book is also visually pleasing because there are plenty of pictures and drawings and headings and subheadings. In addition, important vocabulary words are in bold. In the beginning of the book, you’ll find a full list of supplies needed for each unit. I love this feature as it makes preparing for the upcoming unit so easy! In addition, as with other Apologia books, there is a book extras link. Once you log in, you’ll find links to many topics related to what your children are studying in each unit. For example, in Lesson 3, which covers the Muscular System, you’ll find links to an animation explaining how muscles work, a diagram of muscles of the body, and a diagram of tendons of the foot, just to name a few. 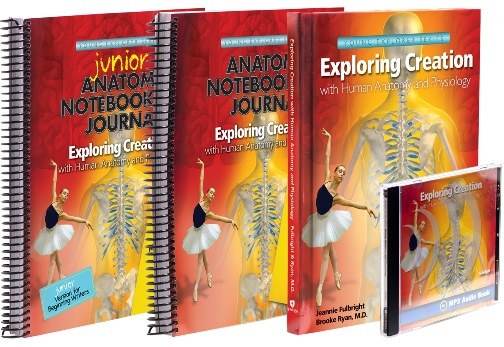 The Junior Notebooking Journal is designed for kids in K – 2nd/3rd grade. PB & J Girl used this journal, and it was just right for her. Activities include notebooking what the student learns, coloring pages, writing pertinent Bible verses, and writing lab notes. My daughter absolutely loved writing down the cell anatomy. Who knew she’d get so excited about this?! In addition, the journal has a “More to Explore” section that includes Book and DVD suggestions so your children can delve even deeper into subjects that interest them. Although you don’t need the journals to complete the science curriculum, I always buy them because I find them important to student learning. In addition, the journals make it easier for me as a teacher because everything is combined in one place and there is the schedule in the front of the journal. The Notebooking Journal is like the Junior Notebooking Journal, but it is for kids in 3rd to 6th grade. The crossword puzzles are more extensive, and what is expected of the child is more than what is expected in the Junior Notebooking Journal. Although 3rd graders can use it, I’d recommend it for 4th to 5th graders as the lowest level, unless you have a more academically advanced child. The MP3 Audio CD is read by the book’s author, Jeannie Fulbright. Before each section begins, there is pleasant music that plays. Fulbright does an excellent job reading with emotion, so it’s not dull to listen to. The MP3 Audio CD would be great for kids who are audio learners, kids who have difficulty reading, or just listening in the car while driving. Apologia recommends that students have the book with them when listening to the MP3 Audio CD so they can see the diagrams. The notebooking journal contains a two day a week schedule. We ended up breaking that down to a four day a week schedule by doing half of the recommended daily work each day. This schedule worked perfectly for us. PB & J Girl used the text and Junior Notebooking Journal. I read the text aloud to PB & J Girl, but if I was too busy, the MP3 Audio CD would be a great replacement and would give her more independence since some of the vocabulary in the book is a bit advanced for a third grader. PB & J Girl loved, loved, loved the experiments, and I had fun learning right beside her. One of the first experiments she did was mummifying apples. We had 8 cups that used a mixture of epsom salt, salt, and baking soda. The purpose was to find which substance mummified the apple best. In our dry climate, the mixtures became nearly rock solid after a week. PB & J thought getting the apples out of the substances was hilarious. Another experiment that was a big hit was to demonstrate how the layer of fluid between the skull and the brain cushions and protects the brain. First, PB & J Girl put a cracked egg in a small container, put on the lid, and then shook it. Of course, the egg was scrambled. Next, we washed the container and then filled it with water. Then we cracked an egg into the water, put the lid on, and PB & J Girl went to town shaking the container, but the egg didn’t scramble. The book is filled with experiments like this. They are quick, easy, and use materials that are largely available at home, but they teach powerful lessons. This was hands down PB & J’s favorite part of the curriculum. We both enjoyed learning more about the body in an easier to understand way. We’ve used several Apologia texts in the past, including Exploring Creation with Astronomy, 2nd edition, and I highly recommend these science programs! I’ve also been equally impressed with the high school programs including Exploring Creation with Marine Biology, 2nd edition. Apologia makes it easy to give your children a solid science education at home.